Dear table hockey players all around the world. In the name of World Table Hockey Association I would like to invite you to the 2nd World billiard-hockey Championship and 1st World multitable Championship. In May 2008 we will find out new world billiard-hockey champions and also best all-around players - world multitable champions! 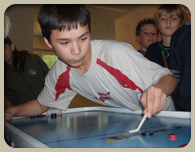 Be a part of table hockey history, take a part at the world championship. We would be pleased to prepare for you good conditions and we would be pleased to meet all of you in Most. Are you a player of any kind of table hockey? Come to Most and become multitable player! Most is situated round 90 km North-West from Prague. We expect players and teams from European countries (e.g. Czech Republic, Sweden, Denmark, Poland, Russia, Ukraine, Germany, Spain, Italy, ...) and from overseas as well (e.g. U.S.A., Canada, Austraila, ...). We hope to meet many more players, not only from mentioned countries. All tournament information are presented on championship website - multitable2008.zde.cz. Important information is also sent by email (WTHA News maillist) - if you are not a member of the maillist yet, connect us. 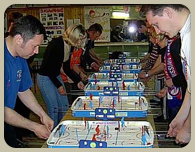 Each country should entry maximally 24 players for individuals competitions of each table hockey discipline (counted max. 16 men, max. 8 ladies, max. 8 juniors). Attention! You should entry different players to different disciplines, however you minimalize their chances to sucseed in multitable. The multitable idea sais that all participants play all disciplines. Players from Czech Rep. should entry only via national assotiations (Unie hráčů stolního hokeje & Český svaz Air-hockey, o.s.)!!! Players from other countries should entry via national assotiations or should entry directly to WTHA. What is necessary to take a part? - Just to come and play! Ask anything what you want to know. However you should entry the competition just before it starts, WTHA prefers the entry in advance! 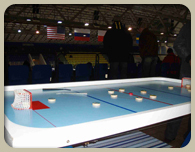 Each country should entry only 1 team for team competitions of each table hockey discipline (minimally 3 players, maximally 5 players in one match). Attention! If your team is big, you should entry specialized line-up to each discipline. On the contrary if you come only few players from your country, the same players (line-up) should take a part in all team competitions. Several countries (Czech Rep., Germany, Sweden, Poland, Russia, etc.) nominate players for team competitions via national assotiations. However, there are pretty lot countries without national team yet. Chance for you! If you are not sure that you can play team competitions as well, ask us. Czech Open is the biggest open billiard-hockey tournament of individuals. Exact conditions for participation will be announced later in competition timetable. Exact conditions for participation will be announced later in competition timetable. If you are not sure about anything, connect us anytime.